And by everywhere, I mean in two PLoS ONE papers this week. (But that’s pretty good!) Stegoceras is the focus of a study on cranial ontogeny in pachycephalosaur skulls, and in head-butting in pachycephalosaurs and artiodactyls. I’ve always thought of Stegoceras as an unofficial mascot for dinosaur palaeontology at the University of Alberta. 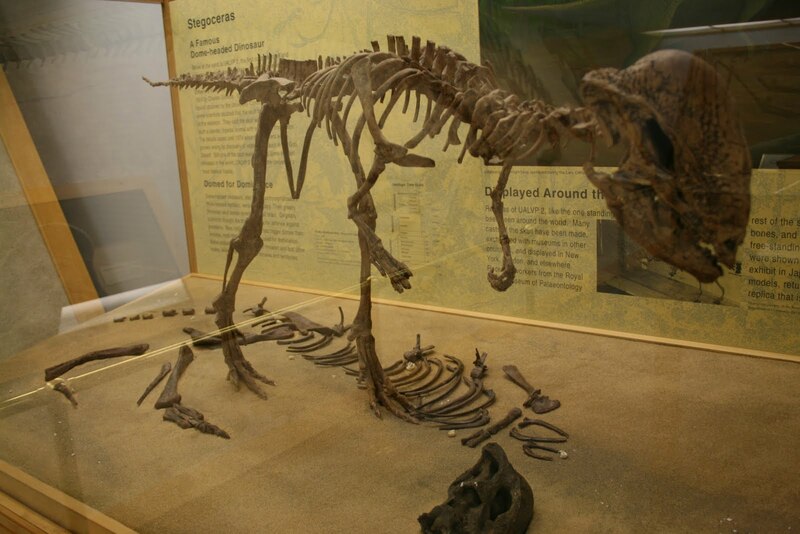 The best Stegoceras skeleton ever collected is UALVP 2 (that’s right, 2! 1 UALVP 1 is a turtle), shown here on display in our museum in the Earth Sciences Building. 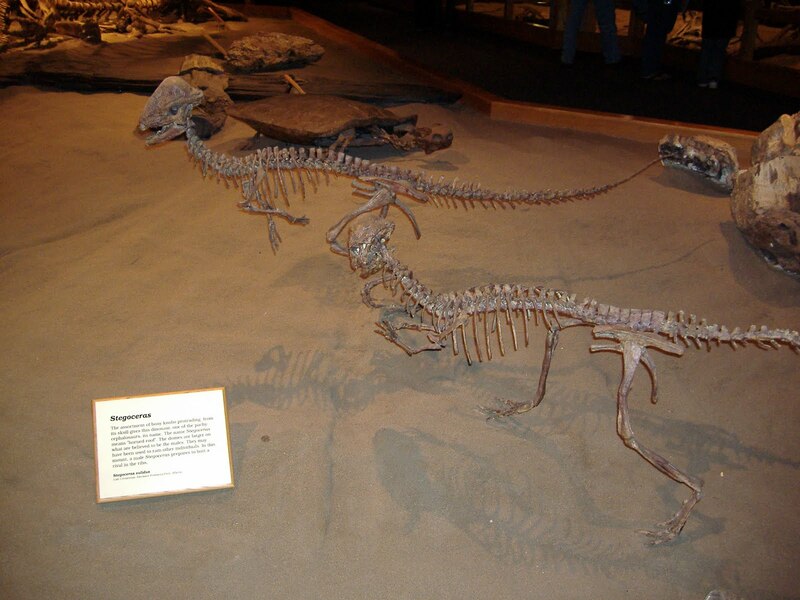 The actual recovered bones are displayed below the mounted skeleton. It’s a beautiful skull, and pachycephalosaur postcranial material is extremely rare. 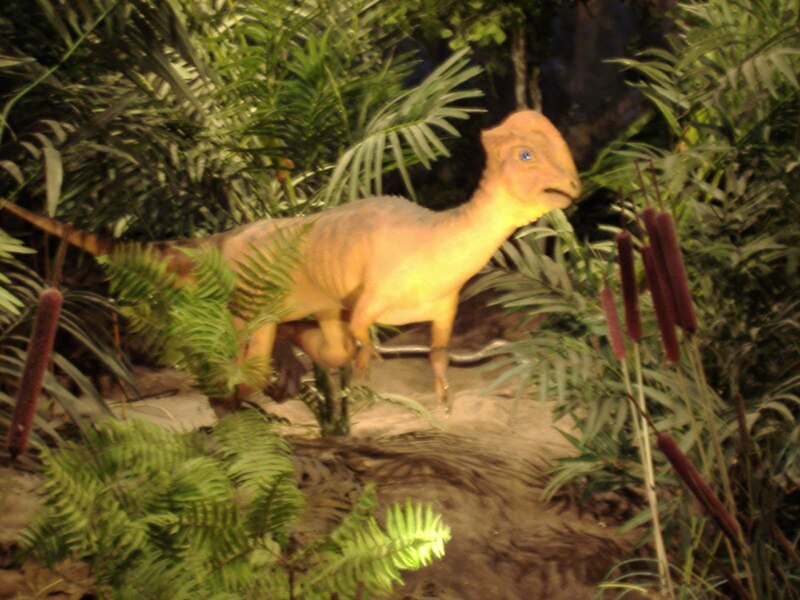 Stegoceras makes an appearance at lots of museums all over North America. Before this corner of the Royal Tyrrell Museum was converted into the new ceratopsian exhibit, it featured a diorama including a fleshed out Albertosaurus, Edmontonia, and Stegoceras. 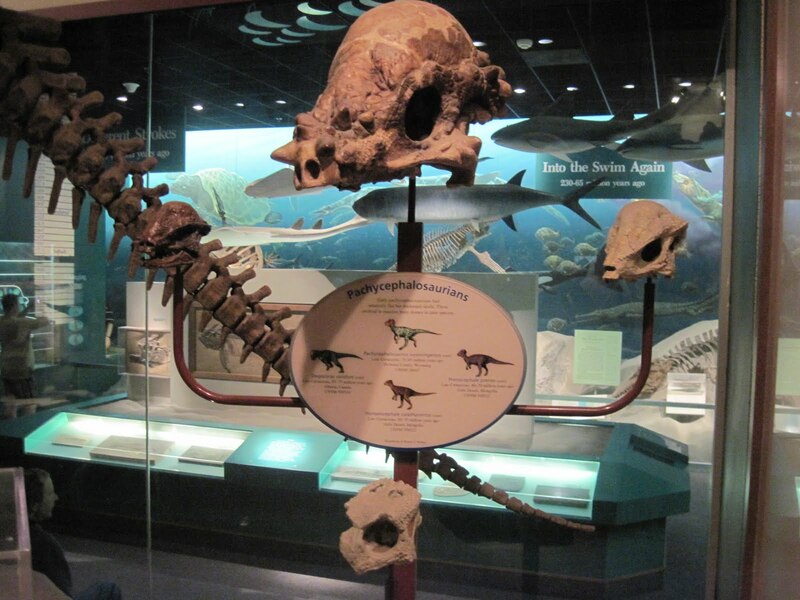 You can still see these two Stegoceras skeletons at the Tyrrell. I even saw the UALVP 2 Stegoceras skull at the Smithsonian last May – can you spot him in this who’s who of pachycephalosaurs? Schott RK, Evans DC, Goodwin MB, Horner JR, Brown CM, Longrich NR. 2011. Cranial ontogeny in Stegoceras validum (Dinosauria: Pachycephalosauria): a quantitative model of pachycephalosaur dome growth and variation. PLoS ONE 6(6): e21092. Snively E, Theodor JM. 2011. Common functional correlates of head-strike behavior in the pachycephalosaur Stegoceras validum (Ornithischia, Dinosauria) and combative artiodactyls. PLoS ONE 6(6): e21422. Has there been an extensive description of the Stegoceras postcranium? Sues H-D and Galton PM. 1987. Anatomy and classification of the North American Pachycephalosauria (Dinosauria: Ornithischia). Palaeontographica Abteilung A 198:1-40.